Chicken and lamb platter at Abyssinia Restaurant. My favorite Ethiopian restaurants are concentrated in Oakland and Berkeley, primarily along Telegraph Avenue. Every once in a while I come across good Ethiopian food outside of that area, but I don’t think I’ve ever been as surprised as I was when I found it in Santa Rosa. I mean, Santa Rosa has great food, but uncommon ethnic cuisines are not exactly its forte. Abyssinia Restaurant has been around for a couple of years, but it wasn’t until recently that I tried it out. Located on Fourth Street, it’s ambiance is a little sparse, but I stopped by for lunch one day with a group and were greeted by a very friendly server. We were seated immediately and began to order. 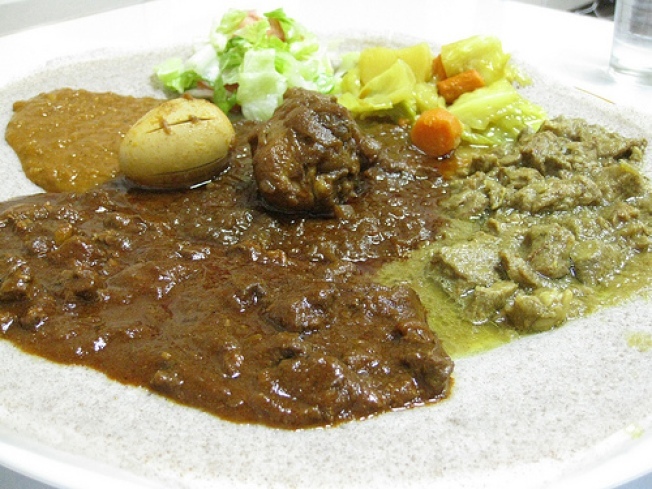 Ethiopian food is generally served family style, on big platters of delicious, spongy, slightly-sour injera bread. We ordered the lamb, chicken and vegetarian platters. Our platters came with all of my favorite side dishes too, from azifa to gomen to atakilt. Ethiopian cuisine is heavy on the lentils and legumes, and they’re usually served with creamy consistency that I love. The chicken and lamb were tender and super-flavorful too and the injera was the perfect device to sop up all the extra juices. My only complaint here is that the food was not as spicy than the Ethiopian restaurants in the East Bay. Perhaps in time they’ll introduce more heat to their dishes. Until then, I’m more than happy to keep going back to Abyssinia Restaurant to satisfy my Ethiopian cuisine cravings when I’m in the North Bay.